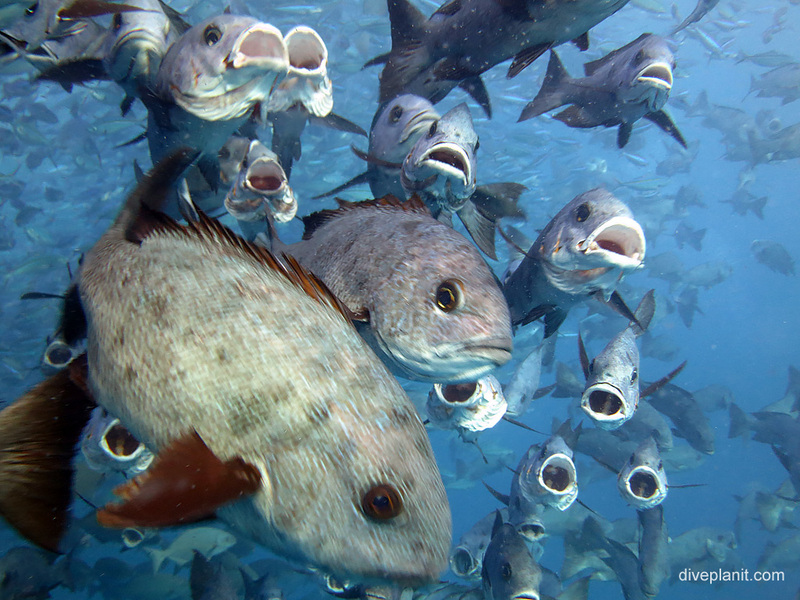 For many divers, Palau is the Holy Grail of scuba diving. The fact that in 2015 the small nation declared 80% of their territorial waters off limits to commercial fishing is one of the reasons why. There are numerous currents from far and near making the waters highly nutritious and supporting a food chain from plankton to mantas, and snappers to sharks and everything in between. Sharks from Paul Collins on Vimeo. Palau was created as a raised limestone plateau, which the forces of nature have carved into hundreds of islands, each with a tropical green coat of foliage. 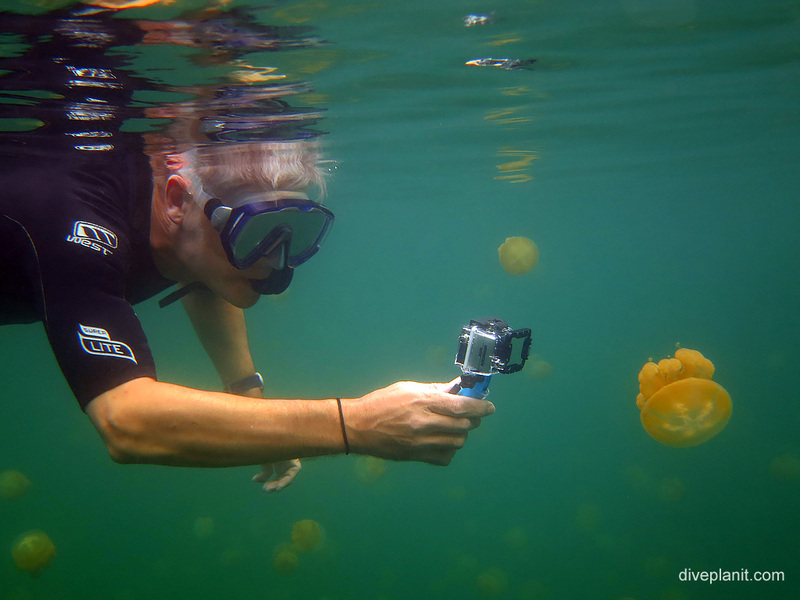 Its formation has also lead to its incomparable Jellyfish Lake – a lake literally teeming with harmless orange jellyfish. 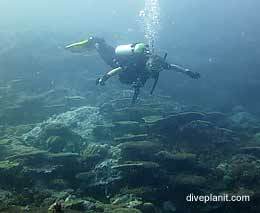 The terrain below the water line is similarly varied with shallow reefs, deep drop-offs, vertical holes, and horizontal caves and tunnels. 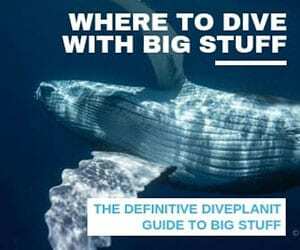 You might want to read about some of the dive sites before you come back to find out how to dive this fascinating place. Palau is approximately 3000 km due north of Uluru! (ie about 800 km due east of the Philippines). It’s hence fairly remote but as such obeys Richie’s Inverse Law of Diving which states: ‘The harder it is to get to – the better the diving will be!’ It’s nearest neighbour is Yap, about 300 km to the north east, and in the same direction, Guam, which is another 600 km onwards. Interestingly, Guam has direct flights from Cairns. Check out the Getting There below. 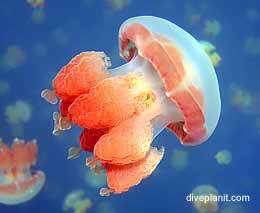 There are a number of Dive Operators on Palau catering for different types and nationalities. 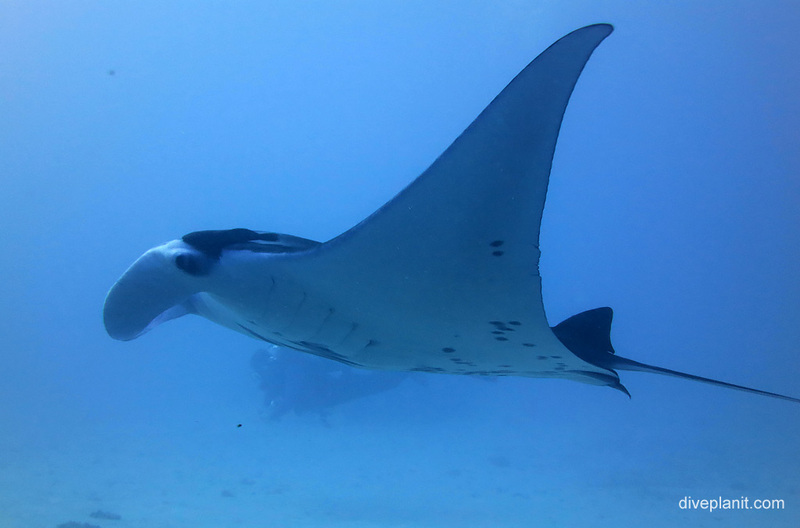 There is also Unique Dive Expeditions which offers the chance to experience a different type of diving in Palau, one that is structured around the phases of the moon the rare and unique biological events such as spawning aggregations. They operate out of Sam’s Tours. 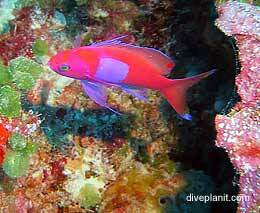 Much of Palau’s diving is on walls, down through holes, or caverns, and drifting along reefs. But there are also spots where you can simple hang (or hang on – take a reef hook), and watch the pelagic action around you. 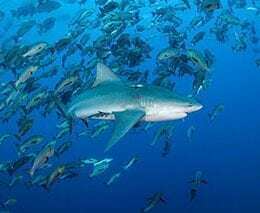 The reefs and walls around the islands fall away pretty quickly to considerable depths, and with the excellent visibility you can often see the sharks circling below. So watch your MOD if you’re on Nitrox and make sure your camera/torch etc is firmly secured. Palau Pacific Resort covers 64 acres of lush tropical gardens on the western shore of Arakabesang Island in Palau. 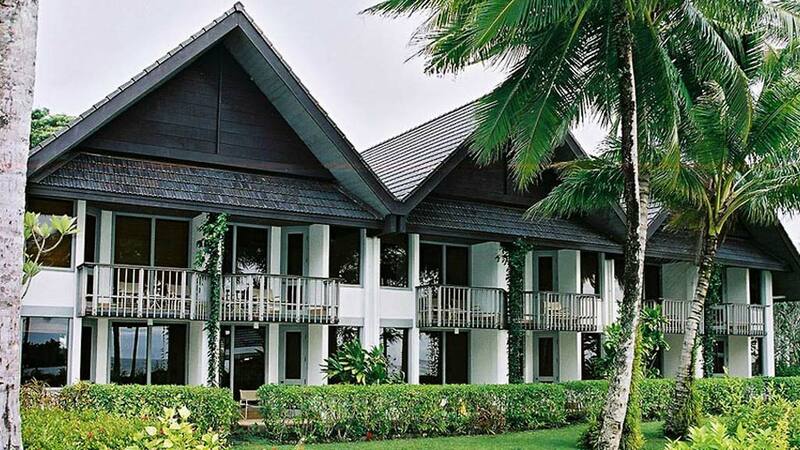 It is one of the most beautiful hotels in Micronesia. 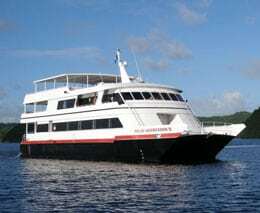 It is located on a peninsula near Koror. The Palau Pacific Resort is one of only 2 resorts here with a sandy beach. It is the only natural beach and the longest beach in Koror. Palau Pacific Resort is a true 5 Star facility. They will cater to all your wishes with 24-hour room service, picnic lunch boxes, chaise lounges with beach towels both at the pool and beach, business services, a boutique and duty-free shop, fitness centre, and professional beauty salon treatments. Relax on Palau Pacific Resort’s private white sand beach or by the freshwater pool, or in a Jacuzzi. You can snorkel directly from the beach to the lagoon and marvel the colourful tropical fish and coral, giant clams and other marine life. Water sports available include windsurfing, sailing and kayaking. Beginner lessons can be arranged. And for the golfing enthusiast, a driving range featuring floating golf balls! Enjoy tennis on courts equipped for night play, and take a guided hike on a nature trail. Children have specially organized activities by the pool and on the beach. Palau Pacific Resort’s four restaurants offer delicious meals to suit a variety of tastes. The Coconut Terrace Restaurant is open all day until late and has casual alfresco dining by the sea. There are live music and other entertainment nightly, extraordinary breakfast buffets and popular theme dinner buffets. Mesekiu Waterhole is an oasis under the palm trees, serving refreshing tropical drinks and light snacks. Akoi Koi Bar and Lounge is a fun gathering place. Meduu Ribtal Restaurant offers a fine dining experience of Pacific Rim cuisine including local seafood specialties. This is the perfect place to watch the spectacular Palauan sunsets! This resort offers 160 elegant and spacious rooms. Rooms feature tropical decor, tiled floors, private patios or balconies, air-conditioning, ceiling fans, telephones, colour televisions, minibars, in-room movies, radios, bathrooms with tubs and showers, bathrobes and slippers, nightly turn-down service and a complete selection of bathroom accessories. There are Garden View rooms which offer a lovely view of the tropical gardens or of the salt water fishpond. These rooms feature one king or twin beds. Ocean View and Ocean Front rooms offer a view of the Pacific Ocean and have one king or twin beds. The luxury Junior Suites have a spectacular view of the ocean, a large living room area, king or twin beds. The luxury Ocean Front Suites also feature a large living area, large plasma screen TV, bar, private patio or balcony, en suite bathroom with double sinks and a large bathtub. Phones and WiFi internet access in all guest rooms. Palau SIM cards for mobile (cell) phones are available for purchase. Mobile phone reception is stable. Internet and email access are widely available in downtown Koror, and Fish’n Fins and Sam’s Tours also provide WiFi hotspots. Exclusive resort in nice surroundings. Anyone who spends a few days in Palau, and can afford it should go for it! 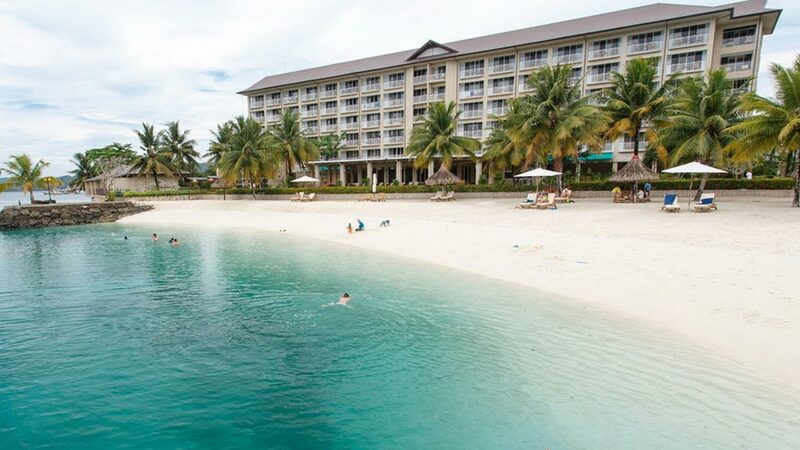 Especially if you want to have a good size beach, this resort is the place to be. Palau Royal Resort is one of the larger oceanfront resorts in Koror on Makalal Peninsula, featuring multiple restaurants and bars on the premises and also a small, man-made sand beach. The drive to Koror airport takes about 25 minutes. The resort is in walking distance to Sam’s Tours. Palau Royal Resort offers 158 luxurious guestrooms and suites overlooking the scenic seascape of Palau’ s pristine waters. There are also smoke-free rooms for the comfort of non-smoking guests. All guestrooms and suites are equipped with LCD TV, in-room safe, mini bar, air-conditioning, overhead ceiling fan and balcony. Rooms are serviced once daily, and guests enjoy free coffee and tea with full room service up to 11:30 pm. Palau Royal Resort has a panoramic restaurant for excellent all-day-dining with wide array of international and Asian cuisine and its delectable home-made pastry items. It also has two bars: Coral Bar inside the restaurant and Beach Bar Breeze situated next to the ocean with a picturesque location facing the rock islands. There is a games room with billiards and table tennis; a Kids Room for children, a Gym for fitness needs and a tennis court for those who need to enjoy outdoor activities. For full relaxation a visit to Manadara Spa at Palau Royal Resort is a totally invigorating experience. All-natural treatments draw on the ancient health and beauty traditions of Asia, from cultures that celebrate beauty and refinement and honour nature’s precious gifts. 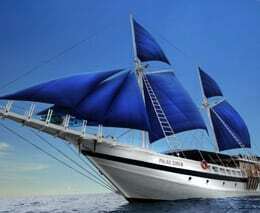 Sam’s Tours offers the most attractive all-inclusive hotel packages for the Palau Royal Resort. All guest rooms can access the internet via a 3G Prepaid Load Card, available at the hotel’s gift shop. There is also a guest internet with several computers available in the library. Internet and email access is widely available in downtown Koror, and Fish’n Fins and Sam’s Tours also provide WiFi hotspots. 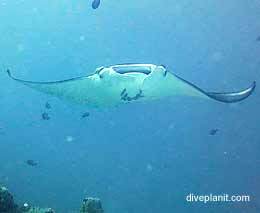 Palau Royal Resort is a good option for divers looking for mid-range accommodation with all amenities of a large resort. The unpretentious Rose Garden Resort is located on the island of Ngerkebesang, tucked away on a hillside with a spectacular view of Babeldaob Island, the Japan-Palau Friendship Bridge, Koror, Malakal Island, and its surrounding lagoons. It takes five minutes by car to get to Koror city centre and about 20 minutes to Koror airport. There are a total of 20 hotel rooms which are located in double story buildings, each building having four rooms. The individual buildings and the restaurant are connected via boardwalks and stairs. Each room is simple in design but built for your comfort. The rooms are equipped with flat screen TV, air-conditioning, ceiling fan, telephone, fridge (minibar optional) and a private balcony with splendid views. Depending on room type they overlook the ocean or the lovely resort gardens. 12 family rooms have 1 king bed and 1 single bed (max. 3 guests per room), 4 twin rooms have 2 single beds each and 4 single/double rooms have 1 king size bed each. The Rose Garden Bar & Grill is well known for its delicious Asian and international cuisine as well as its beautiful views. Services offered by the hotel include laundry and ironing service, daily housekeeping, wake-up calls and safekeeping of valuables in the hotel safe at reception. Reception is open 24 hours a day. They can also assist with tour bookings. Internet access is available in the reception area, widely available in downtown Koror, and Fish’n Fins and Sam’s Tours also provide WiFi hotspots. 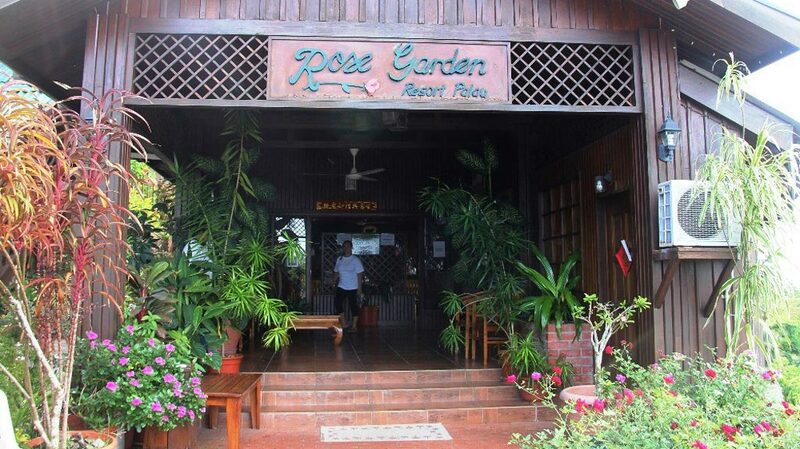 The Rose Garden Resort is a nice and simple hotel in Palau in the lower price range. We believe that they offer good value for money. With four locations in key areas of Koror, West Plaza Hotels provide customers a variety of locations and scenery to choose from, though the hotels have no beach and no pool. The West Plaza Hotels are priced the same and have very good value dive-and-accommodation packages. is located in the heart of downtown Koror, conveniently close to shopping centres, restaurants and government offices. West Plaza Hotel Downtown offers 22 cosy rooms that range from standard to deluxe category. is only minutes from downtown Koror. It offers 22 rooms within easy walking distance of restaurants. 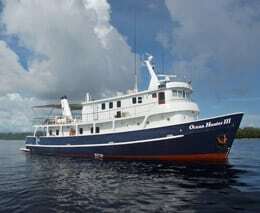 Located within easy walking distance of several dive and tour operators. Accommodation ranges from two-bedroom suites to standard class. This hotel is about 3 km (2 miles) away from the town’s centre, but it is by the ocean. 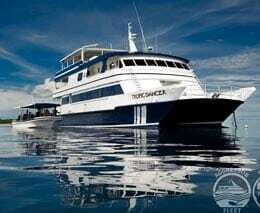 It offers 34 rooms with magnificent views of the ocean, lagoon, and nearby islands. The hotel features a penthouse suite and rooms ranging from deluxe to standard class. Elegant dining at Sea Horse restaurant is available on the premises and some rooms have cooking facilities. Offers 30 rooms next to the banking and educational areas in downtown Koror. This location is within easy walking distance of the museum, government offices and restaurants. West Plaza Desekel is also one of the most popular locations for the dive and adventure traveler. Accommodation ranges from deluxe to standard class. Internet and email access is widely available in downtown Koror. International calling cards can be purchased. Fish’n Fins and Sam’s Tours also provide WiFi hotspots. At West Plaza By The Sea and Downtown, guests can use the in-room wireless high-speed internet access for a surcharge. All rooms provide phones along with free local calls (restrictions may apply). 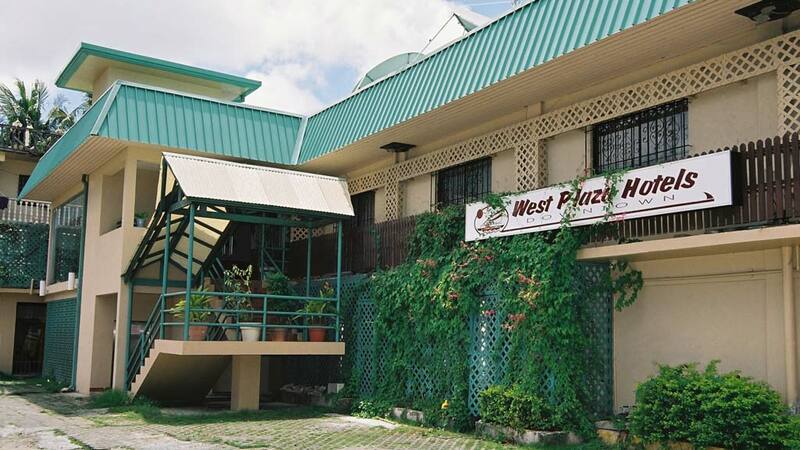 The West Plaza Hotels are a convenient way to stay in Palau. They are comparable with basic American motels. The hotel locations are not the first choice, but the rooms in all hotels are exceptionally big, very clean and tidy. The West Plaza By The Sea is a bit distant from town but most beautifully located. The superior rooms have a beautiful view and there is a very good restaurant in the hotel. The West Plaza Desekel is very central and you can easily reach a number of restaurants by walking. The West Plaza Malakal has the advantage that it is in walking distance from Sam’s Tours. 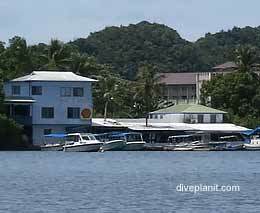 Let’s be honest, Palau’s terrain does not lend itself to acres of flat arable farmland, so most of what you’ll be eating and drinking there has been shipped in in a container. However, that doesn’t mean that it’s not good, or that you won’t be able to find exactly what you fancy. Here are some establishments I can personally recommend. The Bottom Time Bar and Grill at Sam’s Tours. Fully licensed bar, and exactly the kind of grub you need after a full days diving. Beautiful sunsets guaranteed. The Drop Off Bar and Grill on the other side of Main St from Sam’s adjacent NECO’s, has an extensive selection of both food and drinks, and a relaxed ambiance about the place. The previous president dropped in for quiet beer and a chat with friends whilst we were having a pleasant drink there. Kramer’s Café at Pirate’s Cove – also nearby to the above – serves International and Pacific Island dishes in generous portions. Try the famous Hammerhead sauce! This venue also has live music some evenings which certainly beats your typical hotel lobby light muzak! Finally, the Indian Restaurant on Main St in Koror is a must. The proprietor personally selects and imports his own ingredients, and the flavours and aromas in the dishes are testament to his culinary skills. Perhaps save this one until last – before your non-diving day before you fly. There are three main islands – north to south and in rapidly decreasing size are Babeldaob, Koror and Malakai – all connected via a tar-sealed road: Main St. The airport is on Babeldaob about 10 kms from Koror centre, where we stayed, and our dive operator was on Malakai. 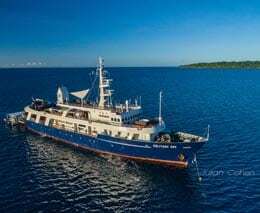 However, getting around is no problem as the accommodation and dive operators have air-condition people movers and will typically ferry you to or from their establishment. If you’re heading out to a restaurant – book a transport or a cab. The ‘down-town’ area is about 1 km long and walkable. Here are four activities for the non-divers or non-diving day. Go on a walking tour of one of the islands. Note that some marine park activities require permits, which will be available via the operator. just check whether then are included in the price quoted. In most respects, Palau is western. The currency is the US dollar, power sockets are US. No inoculations are required. There are no dangerous snakes, spiders or box jellyfish. Safety standards are at Western levels. You’ll be granted a free 30 day Visa on arrival, and be charged $50 ‘Departure & Green tax’ (cash only!) on departure. Still, ensure you have travel insurance, and you’re up to date with your DAN subscription. China Airlines (Taiwan – not to be confused with some Chinese airlines with similar names) fly directly to Palau from Taipei – but not every day. They have direct flights from Sydney and Brisbane (sorry Melbourne!) to Taipei, but again – not every day. You’ll need to play with dates if you don’t want a layover in Taipei. We had a very interesting 24 hours in Taiwan on our way there, and direct connection on our way back. China Airlines also fly directly from many other cities to Taipei, so well worth keeping them in mind if your trip to Palau is part of a bigger adventure. (www.china-airlines.com) Their whole timetable is available as a PDF which makes things easy. Both Korean Air and Asiana fly directly to Palau from Seoul, and Japan Airlines fly directly to Palau from Tokyo; the 5-hour flights cost around US$500. At the time of searching, I couldn’t find any other serious airlines who fly directly to Palau; this might give you a hint as to where most of Palau’s visitors come from. United Airlines fly from Manila to Guam (via Yap) and on to Palau for about US$550. 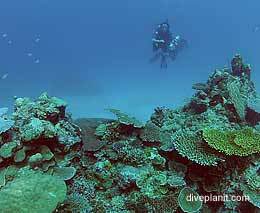 This would be useful if you’re considering diving in Guam as part of your trip, or if you’re en route from or to the US. There are direct flights from Cairns to Guam. Make sure you're up to date with DAN and carrying your card. Keep a US$20 bill for the departure tax.